Enroll your child in Taekwondo classes and discover the amazing benefits they will experience in every area of their lives! You might naturally associate martial arts with hollywood stunts and kicks and punches, but the self defense aspect of martial arts is just a part of it. Sure, children that learn Taekwondo develop the confidence to know that if they are being bullied, they have skills to defend themselves, but the truth is that the real skills we teach are how to diffuse situations with words before it ever escalate to a physical level. We teach children to focus through discipline. In this age of distractions and sensory overload this is a priceless skill that results in immediate improvement in their academic work. Taekwondo actually fosters self-discipline and socialization skills. In fact, many parents whose children have attention-deficit/hyperactivity disorder (ADHD) report tremendous success with our programs because self-control and concentration are exactly the skills underdeveloped in ADHD kids. And did we mention Taekwondo is FUN! What does "improvement in other areas of life" mean? It can mean anything from getting better grades in school, knowing how to use anti-bullying programs to prevent violence amongst peers, or simply the appreciation and pride that comes from learning a difficult skill. Perhaps most importantly, students learn that physical activity is a healthy way to have fun. With serious health problems like diabetes and obesity afflicting younger people more often, parents feel overwhelmed and don't know how to help their child. 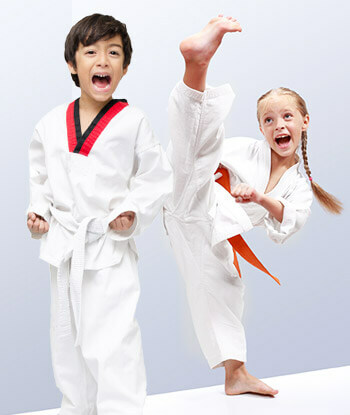 Taekwondo gives kids a fun way to exercise, learn crucial life lessons, and develop a sense of self-reliance. Taekwondo gives parents the peace of mind that their child is getting everything they need to excel in life. At Our Martial Arts School We Teach Discipline And Reinforce Positive Values Like Integrity And Indomitable Spirit. "AWESOME instructors - VERY KID FRIENDLY. Not intimidating, great use of older/experienced students to help break up the kids into groups of similar skill levels to practice technique. Good warm up exercises and great use of time. Owners are extremely personable - Danielle Remarck is a gem - get to know her! They were very flexible with accommodating times and the price is very reasonable compared to similar schools." Prepare your Preschooler or Kindergartner to be a leader. Our Little Dragons class will teach self-discipline and confidence all while providing fun and fitness. This program is specially designed for children ages 3 to 6. It helps to improve children’s focus and listening skills, self-esteem, and gross motor skills. Students learn self-discipline in a fun, structured program that helps build self-control, balance, fitness and flexibility.We recognize that 3 to 6 year olds have very different developmental needs than their older counterparts,and this program bridges that developmental gap and prepares students for the next level. Martial arts is much more than just kicking and punching. It’s about hard work, discipline, and perseverance. It is integrity and indomitable spirit all rolled into one. Dynamis Academy martial arts classes foster respect and self-discipline. Your children will learn not only to respect others, but to respect themselves as well. Martial arts training teaches leadership, self-control, and stress relief. We provide your child with the tools they need to diffuse a bullying situation. Martial arts is a social experience that teaches your child to interact harmoniously and cooperate effectively with others. Not only that, it’s incredibly good exercise, keeping your children healthy and happy!